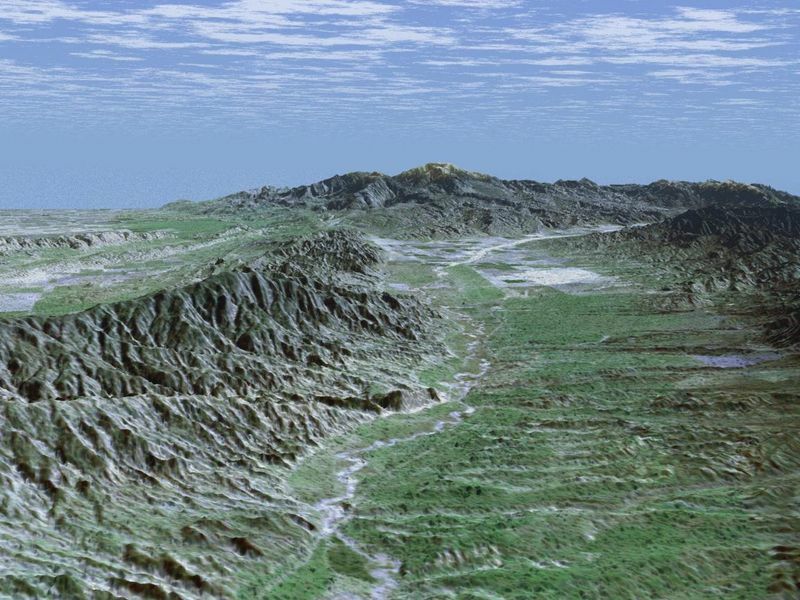 Before the arrival of Europeans, California's Cuyama Valley was inhabited by Native Americans who were culturally and politically tied to the Chumash tribes of coastal Santa Barbara County. Centuries later, the area remains the site of noted Native American rock art paintings. In the 1800s, when Europeans established large cattle and horse-breeding ranches in the valley, the early settlers reported the presence of small villages along the Cuyama River. This perspective view looks upstream toward the southeast through the Cuyama Valley. The Caliente Range, with maximum elevations of 1,550 meters (5,085 feet), borders the valley on the left. The Cuyama River, seen as a bright meandering line on the valley floor, enters the valley from headwaters more than 2,438 meters (8,000 feet) above sea level near Mount Abel and flows 154 kilometers (96 miles) before emptying into the Pacific Ocean. The river's course has been determined in large part by displacement along numerous faults. Today, the Cuyama Valley is the home of large ranches and small farms. The area has a population of 1,120 and is more than an hour and a half drive from the nearest city in the county. This image was generated by draping an enhanced Landsat satellite image over elevation data from the Shuttle Radar Topography Mission (SRTM). Landsat has been providing visible and infrared views of the Earth since 1972. SRTM elevation data matches the 30-meter resolution of most Landsat images and will substantially help in analyses of the large and growing Landsat image archive. For visualization purposes, topographic heights displayed in this image are exaggerated two times. Colors approximate natural colors. The elevation data used in this image was acquired by SRTM aboard the Space Shuttle Endeavour, launched on February 11, 2000. SRTM used the same radar instrument that comprised the Spaceborne Imaging Radar-C/X-Band Synthetic Aperture Radar (SIR-C/X-SAR) that flew twice on Endeavour in 1994. 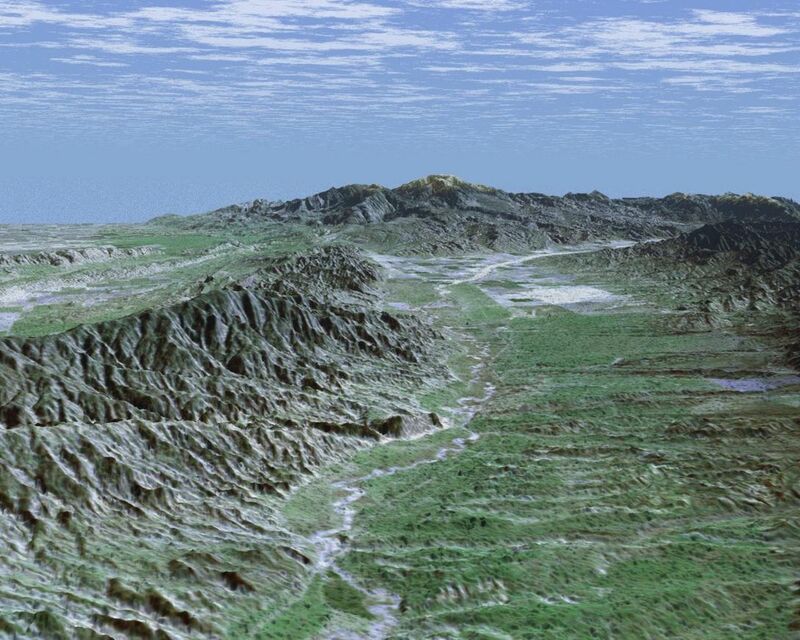 SRTM was designed to collect three-dimensional measurements of Earth's land surface. 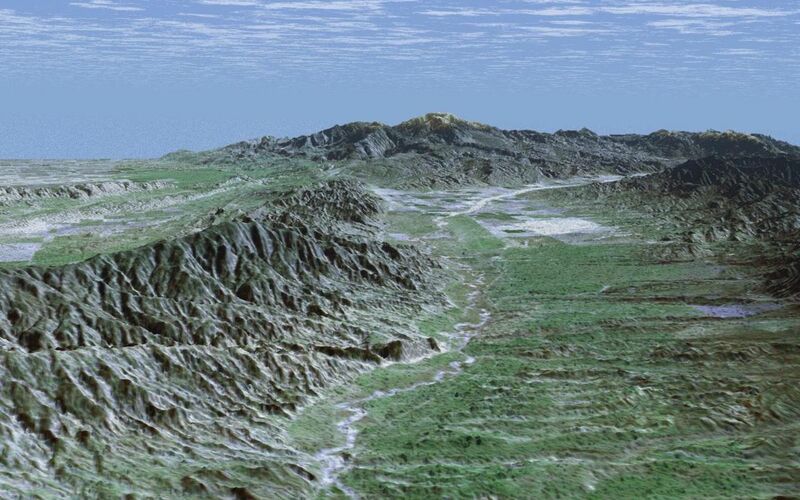 To collect the 3-D SRTM data, engineers added a mast 60 meters (about 200 feet) long, installed additional C-band and X-band antennas, and improved tracking and navigation devices. The mission is a cooperative project between the NASA, the National Imagery and Mapping Agency (NIMA) of the U.S. Department of Defense, and the German and Italian space agencies. It is managed by NASA's Jet Propulsion Laboratory, Pasadena, Calif, for NASA's Earth Science Enterprise, Washington, D.C. JPL is a division of the California Institute of Technology in Pasadena. Location (Center): 34.97 deg. North lat., 119.70 deg. West lon.